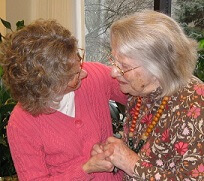 As the numbers of persons with Alzheimer’s increases, the stress experienced by their caregivers becomes overwhelming. Under the burden of this stress, both caregivers and person with Alzheimer’s and dementia suffer. Our focus on these populations grew out of empathy for the stress, confusion and grief experienced by the caregivers and the person afflicted with the disease. In order to make this program a true gift for the caregivers, the workshop, program materials, and lunch are offered to family caregivers for free thanks to the generosity of donors. 9:00 a.m. to 3:30 p.m. each day. Presenter: Rev. Dr. Jade Angelica designs workshops, services and trainings for Healing Moments and offers presentations throughout the country. Jade is the author of Where Two Worlds Touch: A Spiritual Journey Through Alzheimer’s Disease and Meeting Alzheimer’s: Companionship on the Journey, currently available in audio format, and the play, The Forgiving & The Forgetting. Jade’s most important and most rewarding ministry, to date, has been caring for her mother who died from Alzheimer’s in 2011.